Thank you for joining the growing list of Dining Out for Life 2019 participants. We are grateful for your support and the impact you’re choosing to make in our local community. Every dollar raised during Dining Out for Life makes a huge difference to the almost 5,000 individuals who call Desert AIDS Project their healthcare home. We’ve kicked off a new marketing campaign this year and plan on flooding the market with over one million impressions to remind residents to ‘Dine Out. Give Back’ on April 25. Here are some tools to ensure your location is easy to choose when foodies are making reservations for Dining Out for Life. Check your listing and let us know if you’d like us to make any edits. Please invite your friends and fans. We’ll keep posting fresh content here that you can share on your social channels to keep the event top of mind. Join us at Eight4Nine Restaurant and Lounge. We’re partnering with Desert Business Association to get the word out! These are prebuilt and can be downloaded to share on your social spaces so you don’t have to pay a graphic designer to do the work. · You’ll see our ongoing marketing campaign that will end in high impact gravity ads on DesertSun.com, Spadea Wrap of Desert Sun Newspaper, LIVE coverage on NBC, CBS, ABC and digital + social ads throughout the month of April. Over one million impressions to drive awareness. · ‘Dine Here’ Rack Cards will be delivered to your location with acrylic stands by the first week in April. · Ambassadors – If you’ve said yes to having DOFL Ambassadors at your location, we’ll follow up with you by the second week in April to let you know who they are and when they will arrive on April 25. 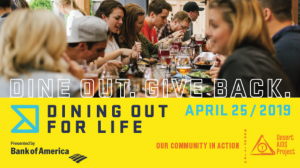 · Dining Out for Life ‘I Dined Stickers’ – We’ll make sure you have plenty of these ‘badges of honor’ to give to patrons of your location on April 25. Newly designed, many diners stack these on to show how many locations they’ve been to throughout the day. Again – Thank you for choosing to support the compassionate health care offered at Desert AIDS Project. As a Federally Qualified Healthcare Center, D.A.P. serves many of our neighbors living at or below 200 percent of the federal poverty level, regardless of their HIV status. We couldn’t do what we do without the generosity of people like you.